In Theatre Pro Rata’s Up: The Man in the Flying Chair, on Park Square’s Boss Thrust Stage until June 11, Mark Benzel plays several characters, including Philippe Petit, the famous French high-wire artist who’d committed what became known as “the artistic crime of the century.” On the morning of August 7, 1974, Philippe wire walked for 45 minutes between the Twin Towers of the World Trade Center in New York City. His cable stretched about a quarter mile above the ground; and he walked, danced, lay down and knelt as he made eight passes along its length. Philippe Petit wire walking between the Twin Towers on August 7, 1974. As Philippe in Up, Mark lives in the imagination of Walter Griffin, the play’s protagonist who’d once gained fame by attaching 45 helium-filled weather balloons to his lawn chair to levitate 16,000 feet, high enough to be seen by commercial airliners. Philippe appears in Walter’s fantasies to give him advice as he struggles to regain his former glory. 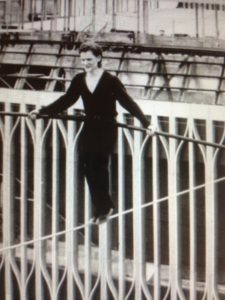 In the script, there’s just a casual mention in the stage directions about Philippe’s wire walking, but the company decided to literally draw out that element in keeping with the magical realism within the play, as an artistic challenge for the cast and to explore the playwright’s intent. With past experience in physical performance, such as juggling, climbing and dropping from aerial silks and theatrical clowning, as well as personal ability to skateboard and unicycle, Mark was confidently game to learn wire walking. With initial instruction by Robert Rosen, a co-founder/artistic director of the now defunct Theatre de la Jeune Lune and current founder/teacher at Studio 206, Mark was ultimately able to make two to three passes on a wire two feet above the ground and ten feet long but, according to Mark, “not altogether gracefully.” More in-depth training with Jonah Finkelstein, who long studied with the famous Grand Canyon wire walker Nik Wallenda, and Laura Emiola of Xelias and support from Circus Juventas helped provide additional Philippe-like confidence. Before wire walking himself, Mark had watched the 2008 film Man on Wire, which suspensefully recreated Philippe’s 1974 stunt by mingling both actual footage of the live event with re-enactments. Mere observation certainly gave Mark an appreciation for the incredible Philippe, but actually experiencing wire walking firsthand gave him “new eyes” to better understand the physical and psychological anguish involved to not only perform the feat, but to also be able to do it with ease and grace. The training definitely gave Mark deeper insight into his character. In a play that delves into the achingly human acts of wishing, hoping and yearning–in a play about contemplating those hard life choices–ultimately every cast member performs a high-wire act, metaphorically if not physically. And the audience gets to step out on that wire with them. One of the most exciting and uplifting aspects of my job is the opportunity to meet some of the newest and brightest theatre talents in the Twin Cities. They are young, ultra-creative, incredibly hardworking and very committed to their work. One of these up-and-comers is Eli Schlatter, who is tasked with designing a fun but versatile set for Park Square Theatre’s upcoming area premiere of a playful comedy, The Liar, on the Proscenium Stage from September 9 to October 2. Just three years out of college with a BFA in Theatre Design and Production from the University of Michigan, Schlatter is a freelance scenic designner and technician in the Twin Cities. His University of Michigan training closely mimicked real-life professional theatre work experiences, which allowed him to hit the ground running upon graduation. At one harrowing point in his career, he found himself juggling designs for three different shows with close opening dates. 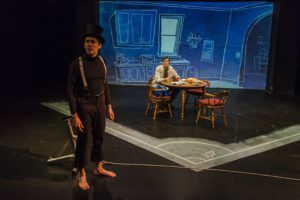 One of Schlatter’s first professional projects in the Twin Cities was as an intern for The Mystery of Irma Vep, assisting director and designer Joel Sass at the Jungle Theater (Sass will direct Park Square Theatre’s The Realistic Joneses on the Boss Stage from September 23 to October 16). To date, Schlatter has freelance designed for numerous local professional theatres, from Yellow Tree Theatre to Theater in the Round Players, and done technical work for such various venues as The Minnesota Fringe Festival and Circus Juventas. 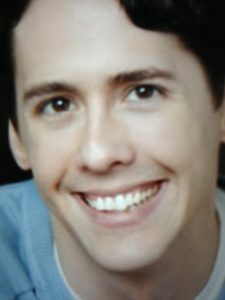 He also works on the run crew of The Children’s Theatre Company. To be successful in his field, Schlatter must constantly put himself out there, actively and bravely searching for opportunities. 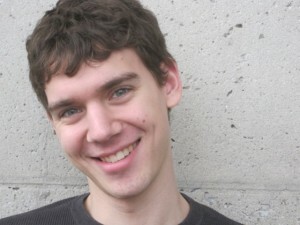 He got the gig designing The Liar with what was essentially a designer’s version of auditioning: sending his resume and condensed portfolio to Artistic Director Richard Cook. Cook had obviously liked what he’d seen because Schlatter got a meeting and, two weeks later, the job. 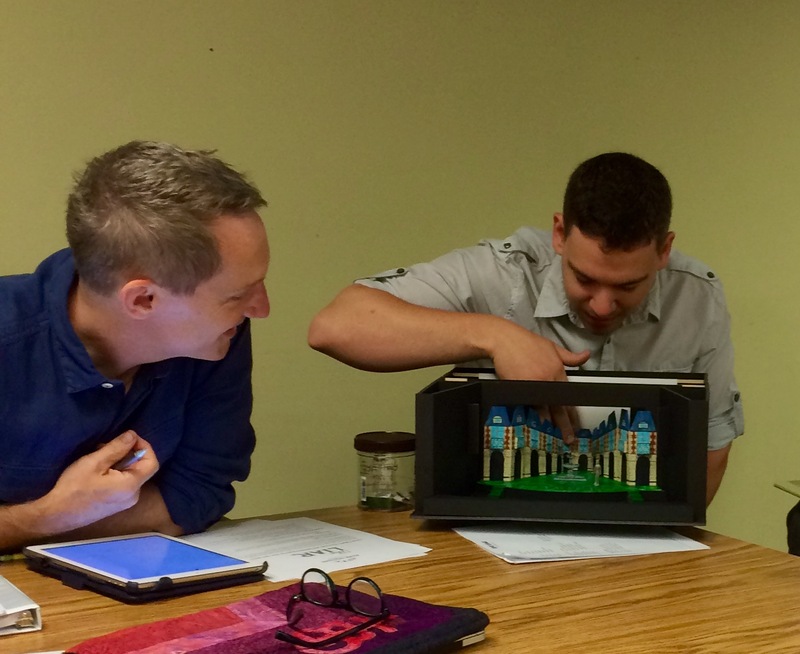 In a future blog post, you can get an inside look at Schlatter’s scenic design process for The Liar. Don’t miss the chance for a glimpse into the making of theatre magic.